Of the billions of pilgrims that eventually succeed in reaching Terra, some are destined to die there. It is considered a worthy death, and the remains of the deceased often become relics on their homeworld. The Officio Sancti Exanimus is tasked with holy mission to preserve and honor the dead pilgrims. The organisation is warranted by the Adeptus Ministorum and divides work among local houses across Terra. The houses are responsible for all deceased pilgrims on Terra, and their worldly possessions. The pilgrims are provided a dignified service, and if possible, a transport to their homeworlds. The Ministorum honours the dead. It is well known in the underhive that Officio Sancti Exanimus is a thoroughly criminal operation. Pilgrims are torn to shreds and every inch of their bodies are mutilated in the search for valuable items or exotic mutations. More often than not the pilgrims aren’t even dead when they get taken. The houses prey on the weak as they compete for power and aspire to nobilitae status. The market for holy body parts and relics is extremely lucrative, and houses with a warrant from the ecclesiarchy are among the most powerful forces on their territories. The wise decision to divide the sanctions on a local basis keeps the houses busy with territorial disputes. These conflicts are resolved usually by family members, and it has become customary that the heirs of houses receive their formal training as regional negotiators. Nowhere is death more noble than here. Nice! Love the ghoulishly compelling backstory. That backstory would make an amazing alternate necromunda campaign setting by itself. Great character too, amazing silhouette, very lovecraftian. You know I started thinking about the same thing! How the competing houses could be a fun mini-game in itself. There will definitely be conflict before the summer.. Absolutely; archeotech replaced by sanctified cadavers and carved bones. Creepy, but a perfect illustration of how nothing is sacred, even on the holiest of shrine-worlds. This is a particularly compelling narrative. It really deepens what life would be like on Terra. And fittingly, it shatters anyone’s preconceptions that the shrine-world that holds the Emperor is a nice place (which I am sure most Imperial citizens dream of). The political strife that surrounds this organ trafficking is an excellent source of deadly individuals. Lady Novellis looks grand. The hat is my favorite part, very fitting of bought royalty. The profile image is wonderfully evocative! I guess we will have many running themes in this project before august. A big one is indeed the tension between the fantastically grandiose and the utterly abhorrent, which go hand in hand in characters and factions. It delves straight into the spine of 40k. Thank you for the kind words and looking forward to meet you! One thing I’m really curious to see is how humanity has both ‘decayed’ and ‘grown’ since the Great Crusade/Horus Heresy. There’s a certain duality here. I mean, on one hand the Great Crusade was an era of glory that was crushed by the betrayal. Everything following the Heresy has been a steady decline. On the other hand though, we see that the Imperium has become more powerful, more aware, grown. The Imperium might be bigger than ever, yet at the same time it’s at greater danger of collapse. We see the same when looking at technology in the Imperium, it’s both described as ‘stagnant’, meaning that the Mechanicus is tightly controlling any kind of development/research, yet we see new stuff being developed all the time (just look at the BFG background, or the new technological developments for the Adeptus Astartes). As I said, I’m very curious to see how you guys will play with this kinda paradoxical nature of the Imperium. Utterly brilliant!!! It’s worth pushing you a bit, isn’t it? This is just so amazing, how everyone is feeding from each others work and creating stunningly and in your case hauntingly beautiful and novel work. Absolutely gorgeous! The full hobby-changing potential of the project is slowly revealing itself to all of us. Finding the right pace and angle, and then pushing it further because of a global group dynamic.. There is so much to be gained! Really interesting work – I echo the comments above about Terra being revealed as an awful place, with all sorts of disreputable con-artists taking advantage of the wide-eyed pilgrims! A bit like the worst tourist destinations on the globe now, but gothic, desperate and scaled up by thousands.. Yes, me living in London is certainly beginning to surface here. Memories of dark winters in Finland keep us bloggers consistent, but everyones dissimilarities are visible in the work. This is a really entertaining viewpoint towards all culture. the hospitiliers have sworn an oath to leave the the fetid sump of rottenchaple and seek the week in the pilgrym swarms to abduct enprisonne and sell their bodies as and when a suitable buyer is revealed – this is a dangerous game for herod and his criminal cohorts and as such an emissary has been sent to seek other criminal allies – slavers, body surgeons, organ grafters and more powerful criminal organisations operate under the corrupt gaze of the exanimus – herod seeks power status and credo ……………. The abduction of pilgrims is a dangerous game indeed. Getting caught is decreed to result in the immediate loss of Exanimus Licentia. But if a straight connection to the House conducting Exanimus rites can not the proven.. There is large network of interested individuals, and facilities including surgical servitors and mutation artisans underground. My first thought on seeing this is that she has a Mexican Day of the Dead feel about her. Great stuff. Didn’t think about that at all! I’ll look into it for the painting. Thanks. The Spectre opening scene is a good reference. Oh how Wonderfully coincidental!!! After the previous post on collaboration I reached out to Migs on the Ammobunker about hoping to contribute some NPC Pilgrims to the cause, my attention was also drawn to the Pilgrims who die on their way to make pilgrimage. I love that your Officio Sancti Exanimus is exactly the kind of organization I imagined would decree that no one is to touch the dead, albeit I had no background thought up only that “The sacred dead would not be touched”. I plan to present one of the “wanted men” who break this sacred law and a small group of their work. “There is no greater honour that can be achieved in life, than death upon the holy pilgrimage. There is no blessing can be given to make one closer to the God Emperor than joining him upon the very ground of Terra. 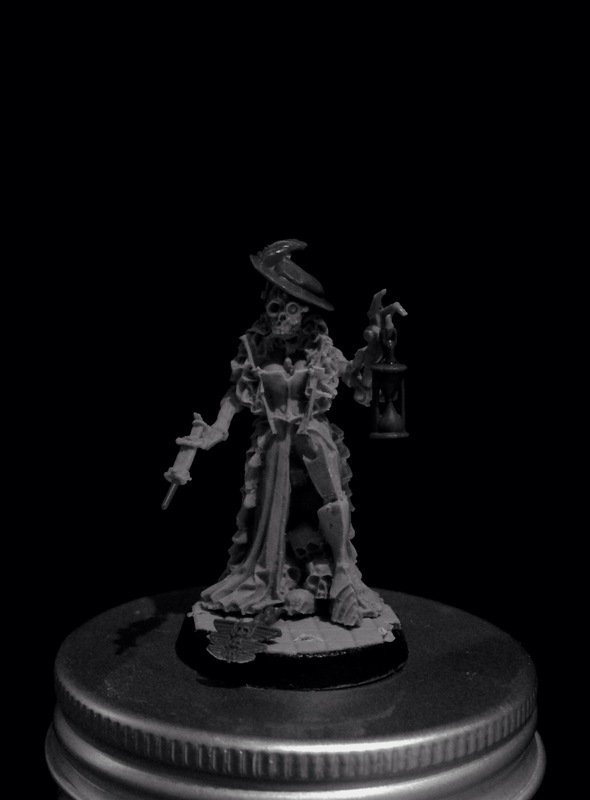 I really enjoy the look of the malformed skull on the refined noblewoman body. The story is compelling and I’ve got so many ideas floating round my head now. Damn weird and I love it. So happy to provide inspiration! Woah, that is grim… I love the Victorianesque bodysnatcher thing going on here – nothing wasted, nothing sacred, no resource overlooked… delicious. A macabre but, as so many have said, compelling story. Emperor rest the Pilgrymmes. Dessicum suggests both dessicated — the dried remains of pilgrymmes sold as relics — and dissect, cut into pieces, which suggests the ‘tearing apart’ and no part being wasted. Relics in this world themselves are often very small parts of a saint’s body (ex ossibus, ex indumentis) and I imagine the greater part of the Officio Sancti Exanimus trade is in these small reliques (an old spelling I rather like) for the pious market. The capture and fate of living pilgrymmes is a more dangerous game — it occurs to me that if THE Pilgrymme were to fall into the hands of Officio Sancti Exanimus hired body-snatchers….